May 5th is International Midwives Day. 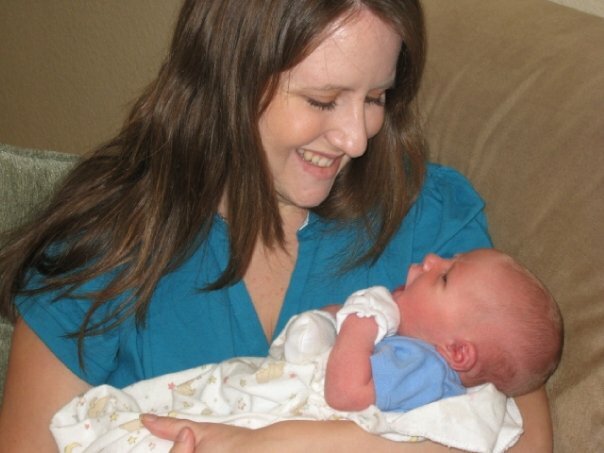 As my son's second birthday is looming large two months away, I thought I would share my homebirth experience and celebrate the midwives who helped me. My son is a second generation homebirthed babe--my mother had all 5 of her children at home, too. 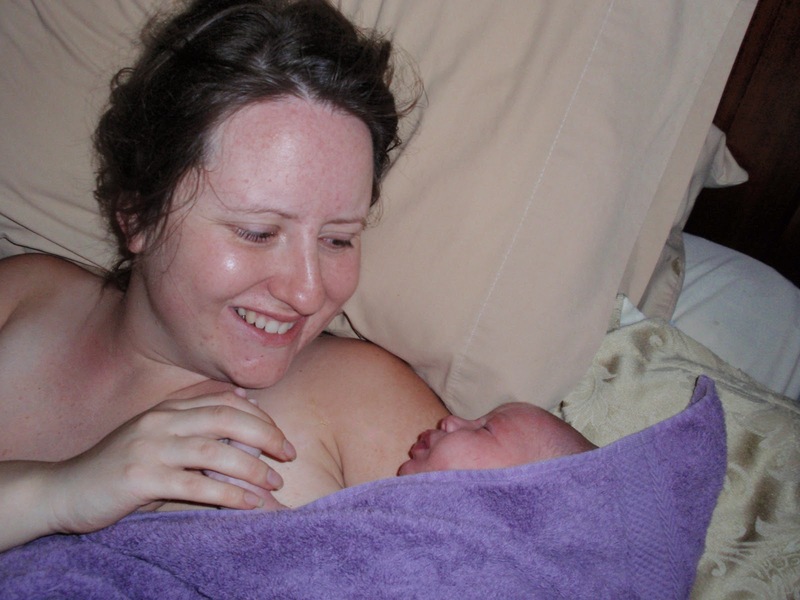 She became a midwife herself and provided wonderful support to me in labor. A huge thank you to her, my midwife Diane Schaub, and my husband for helping me through the most amazing thing I've ever done. Asher was due on my brother Logan’s 21st birthday, July 11th. My mom, who is a licensed midwife in California, came up the day before, and we prepared a family BBQ . My dad and two youngest brothers arrived that Saturday, as did my Grandpa Bob and Grandma Kris and Logan and his girlfriend Brooke. My dad made his famous “Induction Burgers,” which he had made the night before my mom went into labor with both my brothers Shane and Blake. Everyone was hoping the burger would work its magic and get that baby out! Labor didn’t start, but I woke up at 4:30am the next morning to my first “real” contraction. It was a new sensation, low in my abdomen, and felt like a squeeze from the inside. The contractions came fairly steadily, about 7 minutes apart, until I laid down in bed again and they stopped around 10 that morning. The next night, I was awoken at about 12:30 am with more contractions. These lasted all through the night, though never got any closer than about 10 minutes apart. I tried to sleep though most of them, not sure if they would lead somewhere or not. I got up at about 5 am and ate watermelon in the kitchen in the dark, ravenous from being awake most of the night. The contractions stopped in the morning, and I was almost thankful after being so tired. On the 14th, my mom and I spent most of the day running errands around town to prepare for last minute baby stuff. We got a nursing gown and material for a belly cast. I was tired by late afternoon, and we went home. I had a few sporadic contractions through out the day, but nothing to make me feel anything was close. I planned on attending a La Leche League meeting the next day, and wanted to see the new Harry Potter movie as a distraction. We went to the Grand Sierra and had the buffet for dinner. I had been wanting their prime rib my whole pregnancy, and finally got to eat it. We went to bed at about 11pm that night and I was again awoken at about 12:30am with a contraction. I tried to sleep though them, and was in and out of sleep until about 2:30, when I could no longer lay down comfortably. It was very hard to lie still during a contraction. I wanted to be in motion, moving my hips and trying to sway through the sensation. I got up and went to the loft and turned on the computer. I tried to time contractions, but they still seemed a little erratic. I really wanted this to be it, but didn’t want to get my hopes up too soon. My mom woke up and came out to see what I was doing. She told me to try and go back to bed, just in case this was it, and I needed the rest. I reluctantly agreed. When I went back to bed, Eric got up to use the bathroom and I told him I had been having contractions for the last few hours. I started to feel nauseous, and asked that Eric bring me something in case I threw up. I went to the bathroom to sit on the toilet through contractions, and vomited a few minutes later. I knew for as sick as I had been in the beginning of my pregnancy, I wasn’t going to escape laboring without barfing. I had a bit of bloody show for the first time and was excited to think that this was really labor. Eric was timing my contractions on his Iphone and they were about 4 minutes apart and about 30 seconds long. At about 3:30am, I told Eric to go wake my mom. My mom got up and sat with me in the bathroom for a while. She watched me through some contractions, which hadn’t stopped. I asked her if she thought this was really it, and she said she thought it was. I was wondering how long labor was going to last, though things were still feeling pretty manageable. I wanted to be excited, but I didn’t want to expend all my energy and end up feeling drained. I labored on the toilet for a while, and then my mom suggested I lay over my birth ball. I stayed on my ball on my bedroom floor for quite a while. I took off my glasses, closed my eyes and tried to relax as much as possible. But my knees hurt from crouching on the floor, and my mom suggested I take a shower. I asked her when I could get into the bath tub, and she said at 5 centimeters. That became my new motivation and I settled for the shower. The shower felt really nice, and the hot water was comforting. I labored on my ball with my head leaning on my arms on the side of the shower. The water on my back helped relieve some pain. My contractions stayed about the same pace they had. I moaned through them as I needed, trying to keep my voice low and steady. I stayed in the shower until I felt like I needed to be on the toilet again and got out. Shortly after that, I really wanted to be checked to see how much progress I had made. I was last checked at 38 weeks and had been closed and 50% effaced. Much to my surprise and delight, my mom checked me at about 5:30 am and said that I was 5 centimeters and about 80% effaced. I was excited to know I was about half way there. It had seemed to come so easily, I had expected it to be much more difficult than it was. I had been worried that she was going to check and I was only going to be 2 or 3, though that seems like it would have matched the pace for as hard as I felt I was working. Since 5 had been the goal to get into the bathtub, I labored on the toilet a little longer, then wanted to get in. My mom was going to wait until 7am to call Diane, my midwife. She suggested I wait until then to get into the tub. I thought I could wait and continued laboring on the toilet. Once 7 rolled around, we found out Diane had been at another birth and was about 30-45 minutes away. I wasn’t too concerned, thinking I still had a while to go, and got into the bath. I was a bit disappointed once I got in. I expected it to bring more relief than it did, and I think I would get a real birth tub if I were laboring again. I spent a lot of time on my hands and knees in the tub, and laying on my side. Eric and my mom took turns pouring warm water on my back. That felt really comforting, like a warm blanket enveloped around me. I remember looking into my mother’s green eyes during a contraction, not wanting to break eye contact until the squeezing wave had subsided. I didn’t want to be alone, and began questioning if anyone was out of my view for more than a few minutes. I needed to have the support of the family that was around me, even if that just meant knowing they were in the room and focused solely on me. After about a half hour in the tub, I got a sudden, involuntary pushy feeling and I think that is when my water broke. My bag had been bulging when my mom had checked me before and would have made quite a mess if it had ruptured at any other point, which it never did. My mom checked me real quick again and reported that I was complete with just a small cervical lip. I couldn’t believe it. I had been waiting for that “wall” of transition, and it never came. My contractions had remained pretty much the same as they had been, maybe a bit more intense, but far enough apart for me to still get a break. During the contractions, I repeated a few mantras over and over in my head, trying to remember what I had learned in Hypnobirthing class. “I can do this, I can do this,” I thought as the contraction rose up. “This one will pass, this one will pass,” I reminded myself as the contraction crested. As a special reminder, I repeated “Birth is where women find the strength to become mothers”. That last one seemed to be the most important of all of them to keep in the forefront of my mind. Diane finally arrived about a quarter to eight. I was still in the tub and she checked me after she was all set up. She said I was complete, the baby was at +2 station and she didn’t feel any lip at all. I was still in disbelief that I had made it all the way open and even commented out loud that it hadn’t been that hard to get to that point. By then my contractions were feeling more pushy and I grunted through them in the tub for a while longer. I stared at the glimmer from my wedding ring in the water, trying to get into a zone. I was starting to get cold and couldn’t find a good position so I wanted to get out. Sitting on the toilet seemed like a better place and I moved so quickly getting out of the tub, I almost slipped! I pushed on the toilet and that seemed much more effective than being in the bath. Pushing was much harder work than I had anticipated and the motion didn’t come as naturally as I thought that it would have. I clasped my hands together and pushed my palms into one another while I tried to bear down. My contractions were still pretty short, so I didn’t have a whole lot of “urge” to work with. But I did the best that I could. Some one, either Diane or my mom suggested I move to the bed, and try another position and I agreed. Pillows were positioned for me to be on my hands and knees, but I just wanted to bury my head down in the pillows. That was not effective for pushing, going against gravity like that. I ended up in a side lay, and pushed with one leg up. Diane brought ice chips and fed them to me, and they were so refreshing, my mouth was so parched. I pushed and pushed, moving his head down a little bit each time. Finally, his head was starting to stay out a little, even after I stopped pushing and waited for the next contraction. I reached down and felt his wet wrinkly head. It was exuberating knowing that he was so close. I wanted a mirror so I could see and Eric grabbed my make-up mirror from the bathroom. I rolled to my back, and seeing his head became my motivation. When I could see his head emerge a little more with each push, I knew we were getting closer. Diane’s apprentice Liz took the mirror, and I directed where she needed to hold it with each push. My mom was in position to catch the baby, with Diane on my left and Eric on my right. I kept thinking that the next contraction would be it and I would deliver his head. I figured I would get a little rest after his head was out, and even asked aloud if I would get to rest before delivering his shoulders. Diane assured me I would. I wanted so badly for my baby to be out and to get to meet him. I knew I was getting so close, and though I was tired, the finish line within reach. Then finally, in one last big push, out came his head, shoulders and most of his chest all at once! One more little push and the rest of him was out, at 10:32 am, just ten hours since I woke with the first contraction. His cord was wrapped loosely around his neck once, which my mom removed, and then she set the baby on my chest. I was in total disbelief. I didn’t think that push was really going to do it, and couldn’t believe how quickly he came out once his head was out. I couldn’t see his face with the way his head was turned, but I just kept repeating, “my baby, my baby!” I felt exhilarated and relieved, exalted and exhausted. I had dreamed about the moment when I would get to feel his soft, wet body against mine, though the actual feeling was more overwhelming than I could have imagined. I knew at that moment the love of a mother for her child, unyielding and indelible, marked by the incredible journey we had just made together. Diane turned the baby around so I could see his face. He was so beautiful. I had expected him to have a head full of dark hair, but instead he had super fine caramel colored strands. His eyes, alert from the start, looked at me as though he had known me always and I started to sob. Any of the pain from childbirth was gone, instantly replaced with the greatest sense of euphoria I have ever known. I delivered the placenta easily about ten or fifteen minutes later. Eric cut the baby’s cord like a pro. Diane stitched up my tear (I guess that is what happens when you push out head to chest at once!) and Liz did the baby exam. Asher weighed 7 pounds, 4 ounces and was 20 inches long. After the exam, Eric dressed his son for the first time. My heart poured as I watched my husband embrace his son, knowing now we were truly a family. Even as I write this now, 9 days postpartum, I am still in awe of the whole experience. 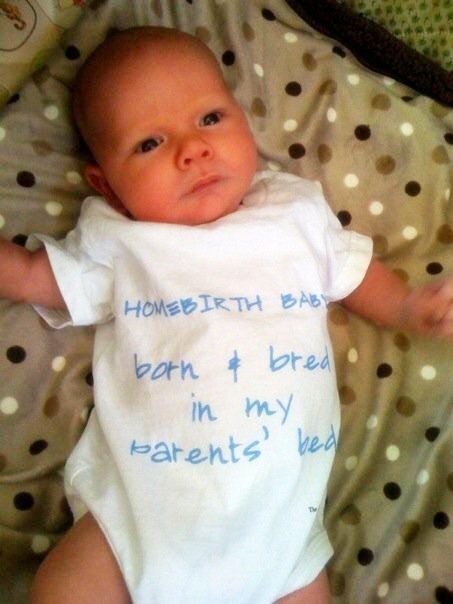 I am admittedly proud for having delivered Asher naturally, and elated that he was born in our bed. After having give birth at home, I would never want to do it any other way. It was an incredible feeling settling down with my new family, in the home Eric and I have made together, and welcoming our son into the world. No matter how many times I read this story it always brings a tear (okay several) to my eye. All of it gorgeous- the mama, the baby, and the story. Dea, I'm sure you could have a lovely homebirth with another baby. We are fortunate to have some wonderful midwives and doulas in our community. I love this. You've put into words much of my experience that I just couldn't find a way to say. :) Thanks!